Presented by E. H. North, 1966. Foliated dish, carved red lacquer. The central panel bears the character 'Shou' for long life and the eight panels of the border each bears a flying crane in clouds with a good luck emblem in its beak. 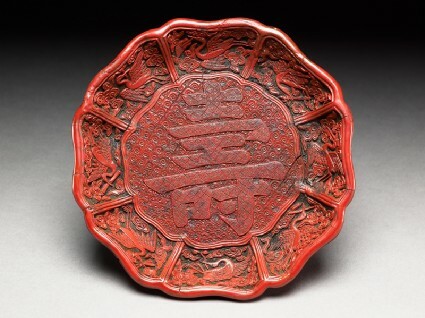 The reverse of the dish, also eight panelled, is decorated with lotus and the eight Buddhist emblems of good fortune. An incised mark inlaid with gold gives the reign mark of Chia Ching (1522-1567) of the Ming dynasty.